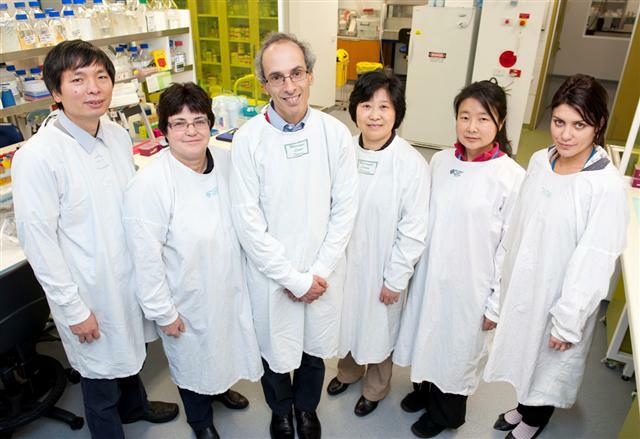 Professor Leon Bach is a Professor in the Faculty of Medicine at Monash University and Deputy Director of the Department of Endocrinology and Diabetes at the Alfred. His research interests are in the role of glycated proteins in diabetic complications and regulation of the insulin-like growth factor system (including IGF-1) in diseases including cancer and diabetes. (1) Insulin growth factors (IGFs) and cancer: IGFs plays an essential role in normal physiological growth. Dysregulation of the IGF system is associated in many diseases, including cancer. IGF binding protein-6 (IGFBP-6) has preferential affinity for IGF-II over IGF-I, and it is therefore a potent selective inhibitor for IGF-II actions. This would enable the therapeutic use of IGFBP-6 to target IGF-II-stimulated tumour growth, while still allowing the normal physiological actions of IGF-I (for example, rhabdomyosarcomas in children). Our current projects include (1) the role of cell surface binding proteins in IGFBP-6 action; (2) the role of IGFBP-6 in tumour angiogenesis; (3) the in vivo effects of IGFBP-6 on tumour growth, angiogenesis and metastasis; (4) the role of the IGF system in ovarian cancer. (2) Development of diabetic complications: Current treatments for diabetic nephropathy (DN) include improving glucose control and blood pressure, and certain blood pressure tablets may have additional beneficial effects. However, some patients continue to develop renal damage despite these measures, highlighting the need for new treatments. We have previously shown that AGEs bind to intracellular ezrin (part of the ERM (ezrin radixin and moesin) family of proteins that link cell surface proteins to the cytoskeleton). Damage to podocytes, a specific kidney cell type, is central to the development of DN and we hypothesize that glucose contributes to this damage by inhibiting the normal function of ezrin. We are looking at AGE-induced changes to podocyte morphology, function and cell signalling pathways in control and ezrin-overexpressing podocytes. Skills: cell culture (over-expression, knock-down, podocyte differentiation); biochemistry (Western blot, IP, Rho kinase activity assay, recombinant protein expression and affinity chromatography purification); molecular biology (mutagenesis, cloning, plasmid preparation, RT-PCR, real-time PCR); cell biology (IF, cell adhesion, migration, proliferation, permeability assays); Biacore biosensor (protein-protein interaction, protein-DNA interaction, affinity/kinetics analysis). Enquiries welcome from potential BSc(Hons), B MedSc(Hons), PhD and MD students.